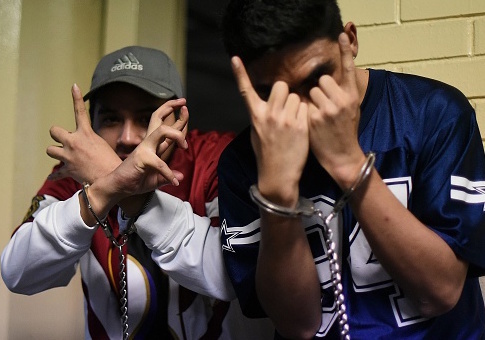 Immigration and Customs Enforcement (ICE) announced on Tuesdaythat more than 1,000 gang members, including alleged murderers and rapists, were arrested as part of a six-week operation targeting gang members involved in transnational criminal activity. Federal authorities, led by ICE's Homeland Security Investigations (HSI), cooperated with state and local law enforcement around the country, with the greatest activity occurring around Houston, New York, Atlanta, and Newark. The majority, 1,095, of those arrested during the March 26-May 6 operation were confirmed gang members with many coming from the Bloods, the Crips, and MS-13. Acting Director for ICE Thomas Homan in a Thursday announcement emphasized the role of local law enforcement in fighting gang activity and harped on the threat gangs posed to communities. "Gangs threaten the safety of our communities, not just in major metropolitan areas but in our suburbs and rural areas, too," he said. Homan added that "efforts to dismantle gangs are much more effective in areas where partnership with local law enforcement is strongest." "If you are a gang member, we will find you," Sessions said, according to CBS News. "We will devastate your networks. We will starve your revenue sources, deplete your ranks, and seize your profits. We will not concede a single block or a street corner to your vicious tactics." Authorities determined gang affiliation based on whether an individual was "convicted of violating Title 18 USC 521 or any other federal or state law criminalizing or imposing civil consequences for gang-related activity." Law enforcement also confirmed gang membership with other criteria such as tattoos or if an individual admitted belonging to a gang. The majority, 955, of those arrested were U.S. citizens, while 445 were foreign nationals from around the world. Three had received protection under the Deferred Action for Childhood Arrivals (DACA) program. Authorities arrested ten unaccompanied minors as well, including nine confirmed gang members. As part of the gang crackdown, authorities seized firearms, illicit drugs, and U.S. currency. "During this operation, HSI and its partner law enforcement agencies seized 238 firearms; various narcotics including 790.15 ounces of cocaine, 546.96 ounces of methamphetamine, 113.42 ounces of heroin, 1.59 ounces of fentanyl, and 8,019.46 ounces of marijuana; and $491,763 in U.S currency," ICE reported. Update: This post has been corrected to clarify the targets of the arrests. This entry was posted in National Security and tagged DHS, ICE, Immigration, Jeff Sessions. Bookmark the permalink.